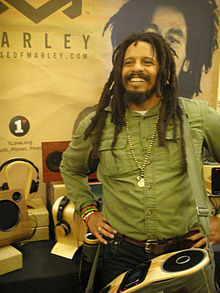 Rohan Anthony Marley (born 19 May 1972) is an entrepreneur and former gridiron football player. He is the son of reggae artist Bob Marley and Janet Hunt. He was born during his father's marriage to Rita, and went to live with her from the age of four until moving to live with Marley's mother after his father died of cancer in Miami in 1981. A 1991 graduate of Miami Palmetto Senior High School, Marley played linebacker for the University of Miami, where he played alongside Dwayne Johnson, Warren Sapp and Ray Lewis. In 1993, he led the Hurricanes with 95 tackles. He later played professional football in the Canadian Football League with the Ottawa Rough Riders. In 2009, he co-founded Marley Coffee, an organic coffee plantation and "sustainable" farming business in Jamaica's Blue Mountains, although the majority of coffee sourced through Marley Coffee is from Ethiopia. The business is run on a 52-acre estate in Portland Parish. In 2011, Marley Coffee went public under the name Jammin Java Corp (OTC:JAMN). In January 2012, Marley advertised a new 'House of Marley' range of eco-friendly headphones at the Consumer Electronics Show in Las Vegas, Nevada. Marley also helps run his family's charitable organization, 1Love, as well as the Tuff Gong Clothing Company. He made an appearance in the documentary film Motherland. On 18 March 1993, while a sophomore in college, Marley married his girlfriend Geraldine Khawly. They had a daughter, Eden, and a son, Nico, a linebacker who played at Tulane and was signed by the Washington Redskins in 2017. Marley met musician Lauryn Hill in 1996 and they had five children. Marley and Hill lived apart for most of their relationship, which ended for good in 2009. Marley took temporary custody of their five children while Hill served a three-month prison sentence for tax evasion in 2013. For years, Hill referred to Marley as her husband, but they never married. Rolling Stone suggested that Marley had never divorced Khawly. However, in 2011, Marley produced a Haitian divorce decree which demonstrated that he had divorced Khawly in 1996. Marley was briefly engaged to Isabeli Fontana, but the engagement ended in early 2013. In 2019, Marley married Barbara Fialho in Montes Claros, Brazil. ^ a b Bruce Newman. "Hurricane From The Caribbean". Sports Illustrated. 13 September 1993. Retrieved on 30 April 2013. ^ Moskowitz, David Vlado (2007). Bob Marley: A Biography. Greenwood Publishing Group. pp. 94–95. ISBN 0313338795. Retrieved 15 January 2014. ^ Raul (26 July 2011). "Bob Marley All His Children & 9 Baby Mommas". FeelNumb.com. Retrieved 15 January 2014. ^ Vecsey, George (29 December 1992). "Sports of the Times; Sugar Bowl Rocks Early With Strains of Marley". The New York Times. Retrieved 2 April 2019. ^ David O'Brien. "This Marley's music has more pop to it". Sun Sentinel. 3 September 1991. 1.C. Retrieved on 8 August 2009. ^ "Lady Soul". Rolling Stone. 18 February 1999. Retrieved on 8 August 2009. ^ a b "Exclusive: Rohan Marley Sets the Record Straight". The Avah Taylor Company. 9 June 2011. Retrieved 23 February 2014. ^ a b "Rohan Marley Ends Engagement". iriefm.net. 5 March 2013. Archived from the original on 12 July 2014. ^ "Tulane Green Wave Football". Archived from the original on 29 August 2014. ^ Czarda, Stephen. "Redskins Sign Linebacker Nico Marley". Redskins.com. Retrieved 16 May 2017. ^ Tiffany McGee and Alex Tresniowski (18 August 2008). "Whatever Happened to ... Lauryn Hill?". People Magazine. ^ "Rohan Marley will take care of kids when Lauryn goes to jail". The Master Copy. 13 May 2013. Archived from the original on 7 April 2014.